It’s easy to see why San Diego has been dubbed America’s Finest City. With 70 miles of coastline and a 4,600-acre aquatic park, this is where California Dreamin’ becomes a dream come true. The beautiful blue Pacific Ocean, miles of pristine beaches, and mild climate that characterize San Diego have been drawing visitors from around the globe since the 1915 Panama – California Exposition. 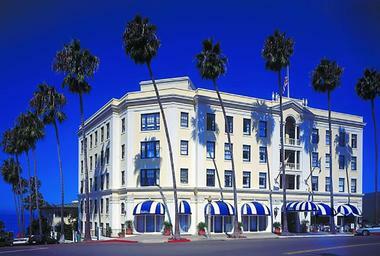 The laidback SoCal vibe translates into gracious hospitality in the city’s hotel scene. Travelers will find every kind of accommodation from boutique hotels and bed and breakfasts to posh resorts and historic luxury hotels. 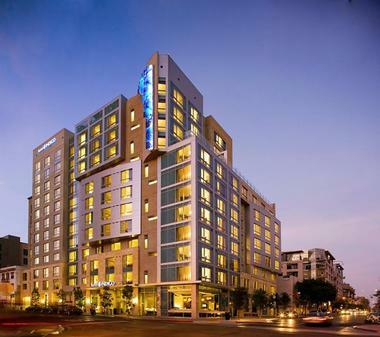 Visitors can expect San Diego hotels exceed their every expectation. This ranch-style retreat is an oasis of comfort on the outskirts of San Diego. Its accommodations are beautifully appointed with luxury linens and custom artwork. Each of the rooms and suites has a private balcony or patio and modern amenities including wireless internet and flat-screen televisions. 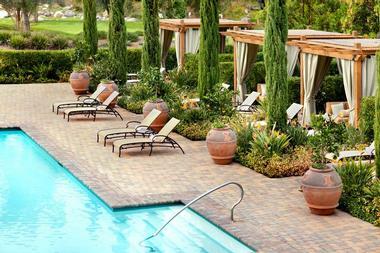 Guests can book time at the award-winning spa and championship golf facilities or float in the saline pool. The inn is well known for its collection of fountains and visitors can use tokens provided by the concierge to participate in the rituals unique to each water feature found in the lush gardens. Staypineapple’s Hotel Z fits right into San Diego’s colorful Gaslamp Quarter – its bright colors make you stop and look at its quirky architecture. The real attention-grabbers are the hotel’s incredibly plush rooms, all with queen or king beds, double duvets, luxury linen, and Tomy Bahama bath products, so you can dive in and relax after a long flight, a day at the beach, or a night of partying. 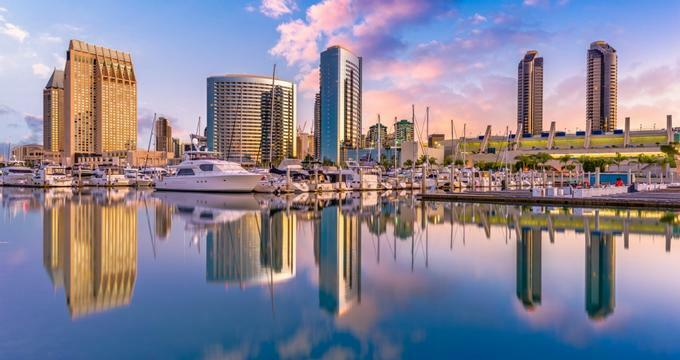 Located in the center of all the action that San Diego is famous for, Hotel Z is surrounded by clubs, bars, restaurants, and venues such the San Diego Convention Center and Petco Park. The hotel has a range of amenities to make your stay even more comfortable: free Wi-Fi, flat-screen TVs, coffeemakers, and even desks if you absolutely have to work. You can even bring your pet – dogs get a comfortable bed and a water bowl. There are free beach cruiser bikes, pineapple yellow of course, and a shuttle that will take you to any downtown attraction. 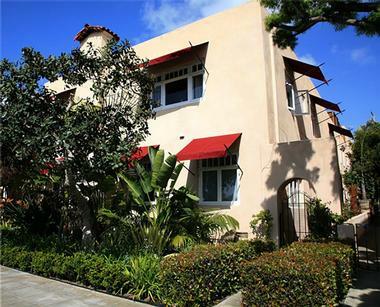 Hillcrest House is situated in one of San Diegans’ favorite neighborhoods. This urban retreat has seven rooms, five of which have been updated in 2017. Room names are drawn from San Diego neighborhoods, the character of which are reflected in their décor. There is a two-bedroom bungalow with private entrance and patio at the back of the property. Breakfast is a heart-healthy, buffet-style affair. Other amenities include off-street parking (a premium in San Diego), Wi-Fi, bottled water, and 24-hour snacks and beverages. The vibrant Hillcrest neighborhood is a premier culinary, craft brew, and wine bar mecca. It’s centrally located to all of San Diego’s best attractions. Located in San Diego’s East Village neighborhood, this recently redesigned property perfectly captures the SoCal vibe. Catering to a lifestyle-conscious clientele, the Solamar has an onsite fitness center that is open 24 hours a day, yoga mats in every room, discounted valet parking for hybrid vehicles, complimentary bicycle use, and exclusive paraben-free toiletries. On select days, guests are invited to participate in an outdoor yoga class on the pool deck. The hotel’s restaurant serves locally grown, organic produce, grass-fed beef, and freshly caught seafood. The Solamar even offers its meeting and event clients customized menus with gluten-free options and rooms with natural lighting. 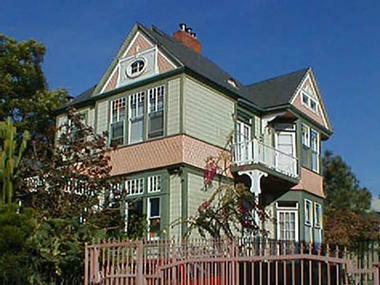 Keating House is a 19th century Victorian building located in San Diego’s Bankers Hill neighborhood. The historical inn has been meticulously restored to its former glory. The Rose Room and the Music Room, both with Victorian décor, are located inside the main house. A 1905 cottage in back offers guests three more choices. The Garden Suite has one bedroom with an en suite, sitting room, kitchenette, and direct access to the garden. The second floor Butler’s room has a queen bed and twin fold-out bed. The bathroom is across the hall. 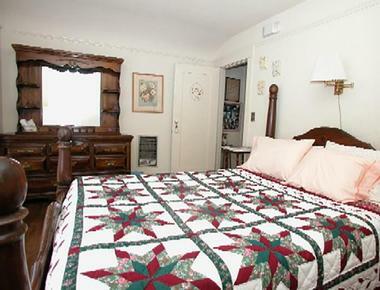 The Chauffeur’s Room is also on the second floor with a full-sized bed. 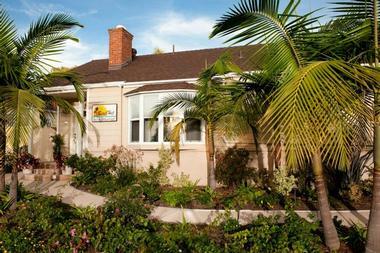 Beach Hut Bed & Breakfast is an elegant and modern B&B on popular Sail Bay in Pacific Beach. There are two rooms available to guests. The signature room is the Tuscan Room at the front of the main house. The Garden Room is located in a separate structure at the back of the property. Both rooms feature a neutral color palette, sophisticated style, and luxury room amenities. Breakfast is “Good Morning” style, where guests can dine in-room from fully stocked kitchenettes whenever they’re ready. There is a saltwater pool set in a beautifully landscaped garden oasis with a patio and marble top fire table. The Westgate hotel is a gorgeous luxury boutique hotel boasting a European ambiance located near Little Italy and the Gaslamp Quarter in historic downtown San Diego. The hotel features some of the grandest guestrooms and suites in the city. Opulent accommodations with sophisticated décor offer incredible views of the city, San Diego Harbor, and the Pacific Ocean. Hotel amenities are just as luxurious as room amenities, with an expansive 24-hour fitness center, a rooftop bar situated next to the heated lap pool, a hot tub, workout studios, a hair salon, and in-room spa services. Westgate also features the legendary Westgate Room, Plaza Bar, and a state-of-the-art business center. 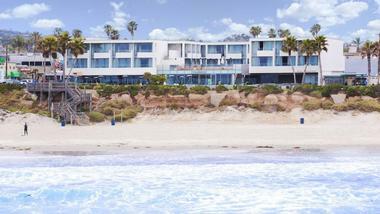 This oceanfront experience in La Jolla exudes Zen tranquility and Bali-inspired hospitality. Luxury accommodations include junior, one, two, and three-bedroom suites with full and partial ocean views. One and two-bedroom cottages also have a variety of views. Hotel amenities include deluxe breakfast, Wi-Fi, afternoon tea, in-room spa treatments, landscaped gardens, an oceanfront patio, an outdoor firepit with seating, and other upscale offerings. Concierge services can arrange for sailing and helicopter tours, among a plethora of other activities. This hotel is an in-demand choice for elegant destination weddings, elopements, and honeymoons. The name says it all. 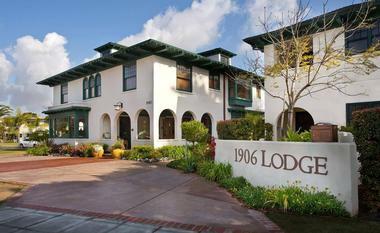 The Bed & Breakfast Inn at La Jolla is exactly that, a historical B&B in the heart of the seaside village of La Jolla. 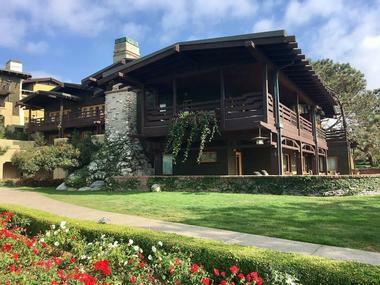 The 1913 home built in the cubist architectural style and meticulously decorated with period furnishings, rich woods, and floral wallpapers wraps guests in casual luxury. There are 15 rooms and suites, each with a unique ambiance. The hotel chef serves a three-course breakfast, which can also be taken in-room or on the patio for guests in the Holiday or Gill suites. Located a block from the beach and close to all of downtown La Jolla’s shops and eateries, there is plenty to see and do. The Pendry, located in San Diego’s historic Gaslamp Quarter, is a classic urban hotel with a sleek, modern ambiance. The 317 guestrooms include 36 suites with king or two queen beds decorated with an ocean-inspired color palette. Luxury room amenities include posh bedding, a 50-inch TV, complimentary Wi-Fi, fully stocked mini-bar, and upscale bathroom accessories. 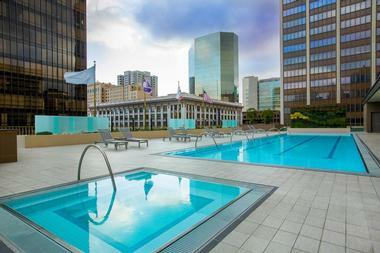 Hotel amenities include a rooftop pool and six restaurants that range from casual to sophisticated. Spa Pendry includes men’s and women’s facilities, a full menu of spa treatments, which can be enjoyed indoors or out, and a state-of-the-art fitness center. 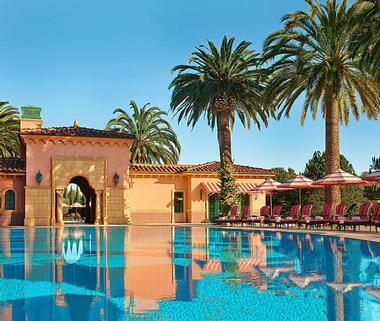 The Fairmont Grand Del Mar is the ultimate in San Diego luxury. 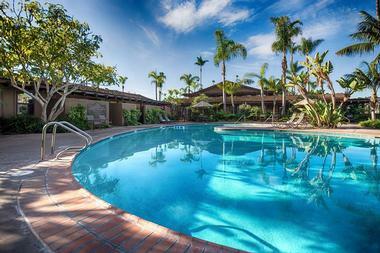 This Mediterranean-style golf resort is situated in a coastal canyon 5 miles from Del Mar’s best beaches. It features a Tom Fazio designed 18-hole golf course, four pools, a luxury spa, yoga and fitness classes, tennis courts, a kids’ club, and their five-star signature restaurant – Addison. There are 249 sophisticated rooms and suites with golf course and canyon views and a neutral color palette. The resort also offers two exclusive villas with three master bedrooms and en suites, state-of-the-art kitchens, media systems, and terraces. 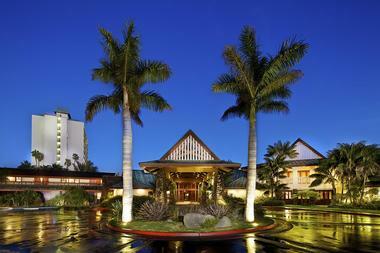 The hotel is near Del Mar’s renowned horse racing track. The Lodge at Torrey Pines is elegantly situated atop towering bluffs overlooking the Pacific Ocean and the renowned Torrey Pines Golf Course. It provides visitors with a woodsy ambiance in opulent five-diamond accommodations. Scottish kilted doormen welcome guests into this chic, rustic space, featuring luxury guestrooms and upscale amenities. Guests can play a few rounds at the public PGA Championship 36-hole Torrey Pines Golf Course, and dine at The Lodge fine dining restaurant and The Grill casual eatery. There is a 9,500-square-foot full-service spa and 13,000 square feet of gracious event space. This is also an excellent hotel for nature lovers, as the Torrey Pines State Reserve is located right next door. 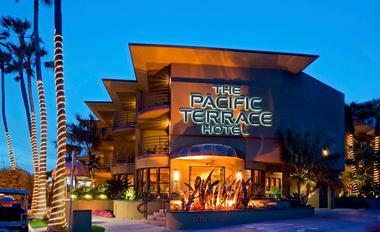 The Pacific Terrace Hotel is a four-diamond luxury hotel situated in the popular coastal neighborhood of Pacific Beach. This family-friendly Caribbean-inspired hotel is located right on the seaside boardwalk and overlooks the Pacific Ocean, offering a collection of guestrooms and suites with upscale amenities. With a décor that includes light-colored travertine floors, soft floral seating trimmed in dark wood, plantations shutters, tropical plants, and palms, guests will feel more like they are in the Caribbean than this eclectic surf town. Hotel amenities are equally impressive with unlimited use of beach chairs, bikes, umbrellas, and boogieboards as well as an ocean-facing heated outdoor pool and spa and a fitness center. Located in downtown La Jolla, the Empress Hotel is a beach-themed boutique hotel overlooking the Pacific Ocean and boasting an elegant nautical décor reminiscent of summer beach houses in the Hamptons. The hotel provides a complimentary breakfast in their charming breakfast room or on the outdoor patio. 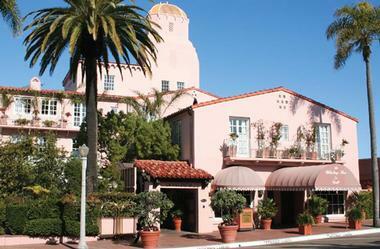 For lunch and dinner, guests can dine in the hotel’s signature Italian restaurant, Manhattan of La Jolla. During the day, visitors explore the upscale neighborhood of La Jolla, where they’ll find a plethora of boutique shops. The wealth of watersport activities at a diverse collection of beaches – Windansea, Hospitals, Children’s Pool, and La Jolla Cove – will keep any outdoor enthusiast busy. Tower 23 is located mere steps away from the legendary Crystal Pier in Pacific Beach, featuring ultra-modern, high-end design and décor, perfect for the savvy adult traveler. This exquisite beachfront property offers sleek guestrooms with signature Serenity beds, a blend of glass, teak, and chrome finishes, and a white and cool blue color scheme for an air of modern tranquility. They are known for their award-winning cuisine at their trendy JRDN Restaurant, which serves California cuisine with a sophisticated edge. The hotel’s beachfront location offers easy access to beach activities, funky beachside shopping, diverse dining opportunities, and PB’s energetic nightlife. 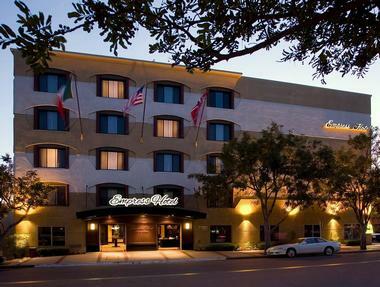 Courtyard Marriott in the Gaslamp Quarter is a perfect choice for business travelers. 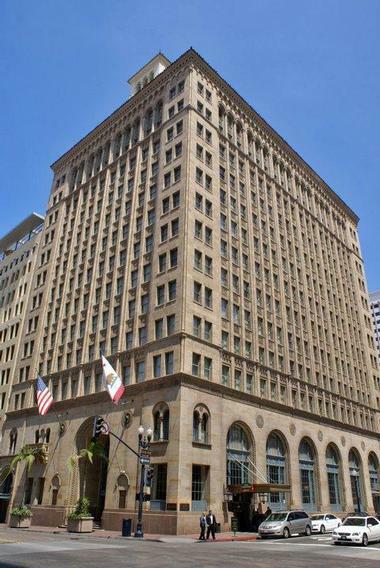 Located in the historic Bank Building, the hotel is within walking distance of the San Diego Convention Center and is close to San Diego Superior Court. 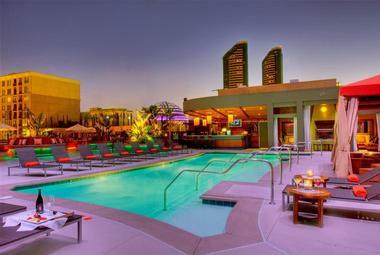 The sophisticated hotel has a full-service restaurant and lounge and offers discounted stays to law firms. Courtyard Marriott is also one of San Diego’s green hotels and has earned several sustainability awards, and guests and employees participate in green initiatives. Luxurious rooms have hi-tech amenities, many with ocean or cityscape views. Hotel amenities include a 24-hour market, state-of-the-art fitness center, Starbucks espresso bar, and complimentary business center. 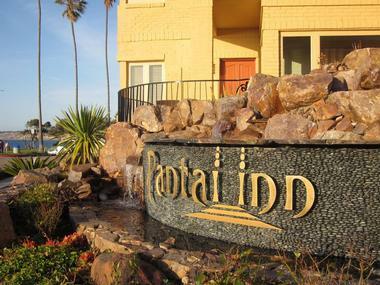 The Catamaran Resort Hotel and Spa can be found in San Diego’s relaxed Pacific Beach neighborhood. This oceanfront resort is conveniently located near many of San Diego’s tourist attractions, like the city’s renowned zoo or Legoland California, but families who want to “get away from it all” will never have to leave the hotel for a true sun and surf vacation. Outdoor movies, an arcade filled with classic games, and exotic bird shows are some of the hotel’s many on-site attractions. After a day by the pool or at the beach, everyone will enjoy the Catamaran’s sunset luau featuring a Polynesian buffet and entertainment. Upscale La Jolla is home to the historic Grand Colonial, a boutique hotel with modern coastal decor and exceptional amenities. Travelers combining business with pleasure will appreciate the complimentary high-speed Wi-Fi and well-equipped meeting and event spaces. The hotel’s sophisticated NINE-TEN restaurant is the perfect place for a farm-to-table meal and a glass of wine from one of California’s world-renowned vineyards. Custom menus are available for business meetings and corporate events in one of the restaurant’s three private dining rooms. The hotel’s staff is even available to assist in planning the perfect team building activity! From island-inspired guest rooms and suites to a full range of standard amenities, this Best Western provides everything needed for a comfortable home base from which to explore beautiful San Diego. Sports enthusiasts have a wide variety of options at this Shelter Island hotel, and guests can borrow a bicycle and pedal along the island’s paths while enjoying a spectacular view of the bay. Tennis courts, outdoor pools, and a fitness center with weight and cardio machines are also available. Guests will enjoy relaxing in the hot tub, whirlpool spa, or by the poolside fireplace after a full day of activities. 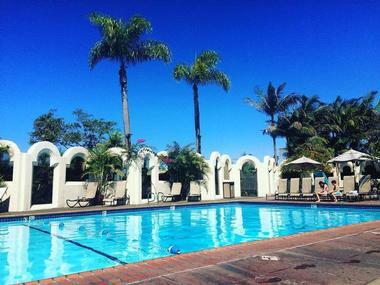 The Bahia Resort Hotel is an ideal choice for families who love fun-filled vacations under sunny SoCal skies. Not only is it close to all of San Diego’s major attractions, it has plenty of on-site activities as well. Parents and children can spend time together surfing, cycling, or sailing with equipment rented from the hotel or borrow a racket for a game of tennis on the property’s lighted courts. The beach is always a family favorite and the hotel provides its guests with complimentary cabana chairs to soak up the sun. A family hour cruise on the Bahia Belle is perfect way to end a day of adventure! 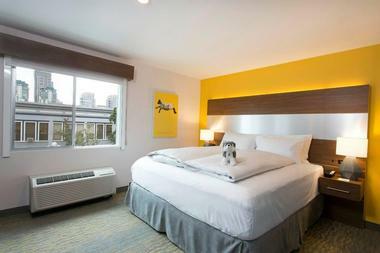 This boutique hotel in the historic Gaslamp Quarter boasts that it offers the “pet-friendliest accommodations is San Diego.” Dogs are pampered almost as much as their owners with the purchase of a pet package that includes a cupcake from a local pet bakery, a fluffy dog bed, food and water bowls, and a complimentary copy of Fido Magazine. The hotel’s website lists nearby dog-friendly restaurants where you can grab a bite to eat with Fido by your side as well as local beaches and parks that welcome your four-legged friend. Best of all, there’s no additional fee and no size limit! 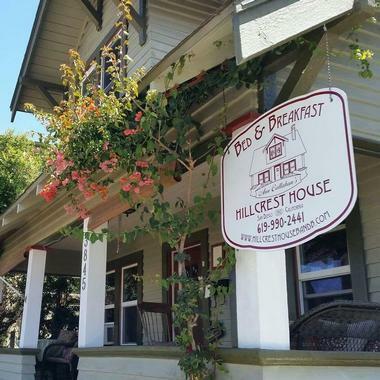 Carole’s Bed & Breakfast Inn is located in one of San Diego’s hippest neighborhoods. The wildly popular 30th Street Corridor is lined with brewpubs and microbreweries. North Park is also home to a vibrant art scene. Carole’s Craftsman style home is cozy and comfortable. Guests can choose from four rooms in the main house, a one-bedroom casita with a full kitchen, a two-bedroom vacation rental, and a studio. Amenities include a swimming pool with lounge area, a continental or full hot breakfast at a large family-style table, and a sitting room for reading, watching movies, or conversation with other travelers. The Bay Club is a nautically themed hotel with its own private marina on Shelter Island. 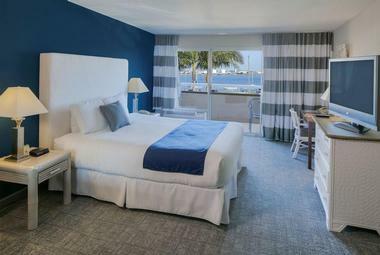 The neutral and blue tones of the guest rooms complement the colors of the bay and make the spaces feel open and airy. Guests can enjoy waterfront dining at The Quarterdeck Restaurant and Bar, where California-style comfort food is served for breakfast, lunch, and dinner. Complimentary electric service, water, and Wi-Fi is available to boats docked at the marina. Boaters who reserve one of the live-aboard slips have access to the hotel’s facilities as well as the shower and coin laundry facilities at the marina.